Thanksgiving is a favorite holiday for many. It's a time to eat, indulge and spend uninterrupted time with family. It's also a time for reflection. A time to think about what we're thankful for and a time to think about how the choices we make impact our families and the planet. Although every day provides an opportunity for reflection and change, Thanksgiving stands out as the perfect day to kick off a few new habits that will effect the longevity of our planet. If each of us revamped our consumption and waste habits by slightly adjusting what's already in place, the overall impact could be huge. Here are a few tips for the Thanksgiving holiday that will reduce our carbon footprint and help keep the planet healthy for generations to come. Shop locally this Thanksgiving and lend your support to the little local business rather than the big box stores. Go for holiday supplies that don't need to travel far to get to your Thanksgiving table. Organic food typically requires 30-50 percent less energy during production than its conventional counterpart. 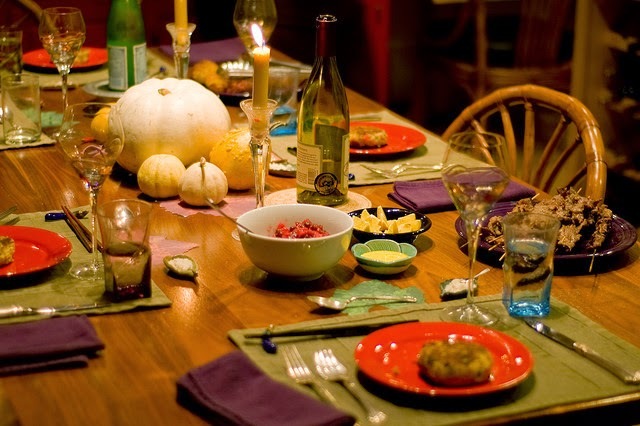 Make the shift this Thanksgiving to a table with more organic food choices. Knowing that your food isn't sprayed with pesticides, chemicals or GMOs is enough reason to incorporate organic foods into your menu. Watch your home heat up on its own as your Thanksgiving guests arrive and as the oven is turned on to warm the food. Rather than opening windows to cool off the space, remember to set the thermostat a few degrees lower before the celebration begins. Make the switch to reusable napkins, skip the paper towels and pull out the good dishes this Thanksgiving. It's a bit more effort at the end of the evening, but it's worth it. Each person in the United States uses 749 pounds (340kg) of paper every year. According to the Natural Resources Defense Council, the pulp and paper industry may contribute to more global and local environmental problems than any other industry in the world. The industry is the third largest industrial emitter of global warming pollution. Reducing is the first of the 3 Rs: reduce, reuse and recycle. When planning your Thanksgiving celebration, try making some slight alterations to your shopping list. Give some extra thought as to whether or not you truly need those items on your list and reduce the amount of food and decorations if possible. Did you know that a typical household throws away an estimated 474 pounds of food waste each year? That means about 1.5 lbs. per person a day in the United States. Food scraps generated by all households in the U.S. could be piled on a football field more than five miles (26,400 feet) high. Compost those vegetable scraps and watch your garden thrive. Fill your dishwasher to capacity before running a cycle. You'll end up saving water, energy and detergent. Make the switch to non-toxic cleaning products. When making the switch to green cleaning products, replace products you're currently using as they run out with a safer version. Take the time to research safer, non-toxic products and then make the switch. According to USA Today, it's predicted that 24.6 million passengers will fly on U.S. airlines domestically and internationally between November 21 and December 2 this year. That's a 1.5 percent increase from last year, or 31,000 more passengers on average a day. For many of us, traveling is a long-standing tradition and needed to visit with our family. Use this handy calculator from The Nature Conservancy to help you calculate the amount of carbon you emit and offer ways of offsetting those emissions. If your plan is to drive, make sure your tires are fully inflated and your car has been properly serviced. This will help reduce your carbon emissions and improve your gas mileage.